After only a week or two, my on-the-way-to-becoming-awesome sewing room is my favorite place to be! I'm so happy in here and find myself making sure the cutting table is cleaned every night so I can come into a room where I can instantly start creating. This week, I'm doing some more cleaning and clearing out and I solved a years' long problem. I'm a fan of Marie Kondo's The Life-Changing Magic of Tidying Up. I own the book on kindle and audio. When the book was first published, I tore through my linen closet, clothes closet, bookshelves, and elsewhere. 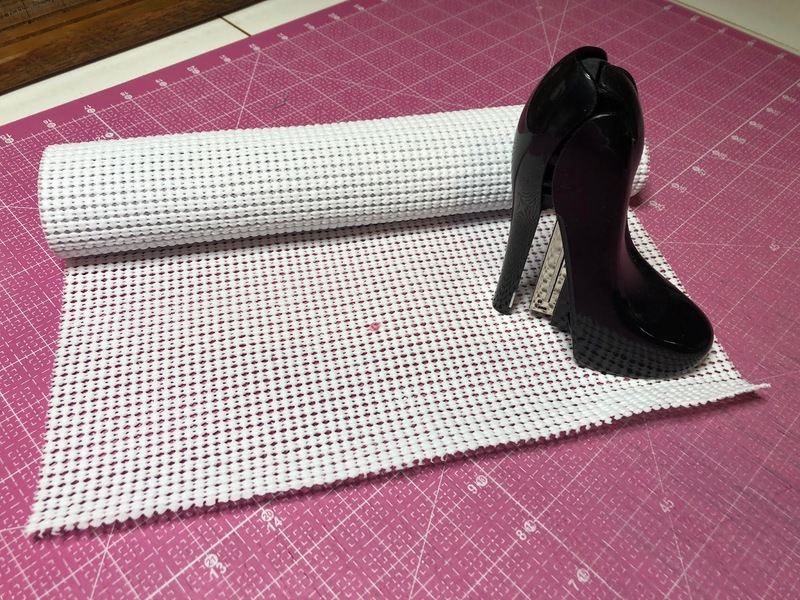 I started in my sewing room, but only got as far as "only keep what sparks joy" and got rid of the abandoned craft supplies that made me feel guilty. Marie Kondo now has a short season show on Netflix called Tidying Up. I haven't binge-watched a show in a long time (I'm more of a book girl lately) but I watched this over the weekend. It was charmingly delightful and quite timely. I've read mixed reviews, but I love watching homes move from chaos to calm. I'm slowly working on the rest of my sewing room. I cleaned out under a quarter of one of my longarms. I swept up an entire herd of dust bunnies (RIP) and found many forgotten quilt projects, one started NINETEEN YEARS AGO! I hope to clean and organize this sewing space by getting rid of containers rather than buying more, but I will admit that I've been checking out some IKEA storage hacks that I would love to install in here when I'm pared down and ready to make things pretty. I cut a large sheet of cardboard from the box, stapled the shelf liner to it, and placed the cardboard under the legs of my sewing table so it doesn't move. It ain't pretty, but it works! 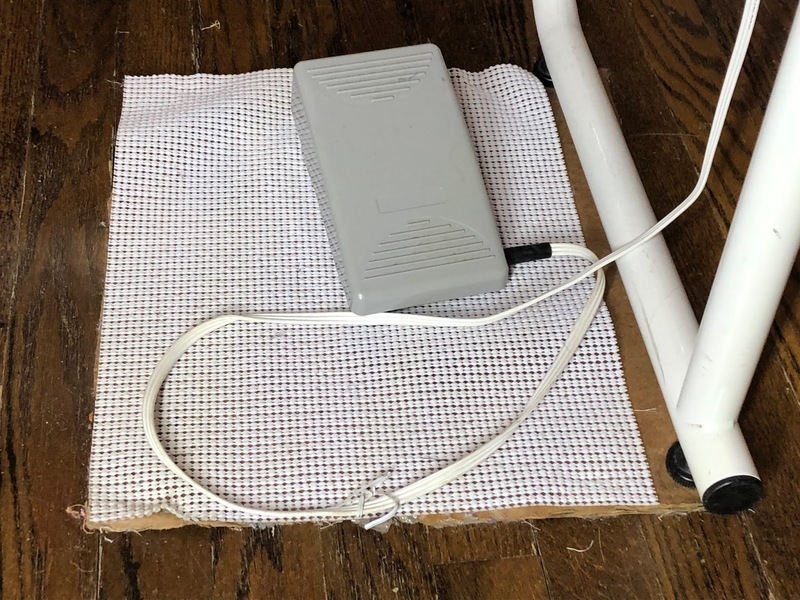 Maybe someday I'll make a pretty version of this, but for now I'm just excited that my foot pedal is where I expect it to be. Every. Single. Time. 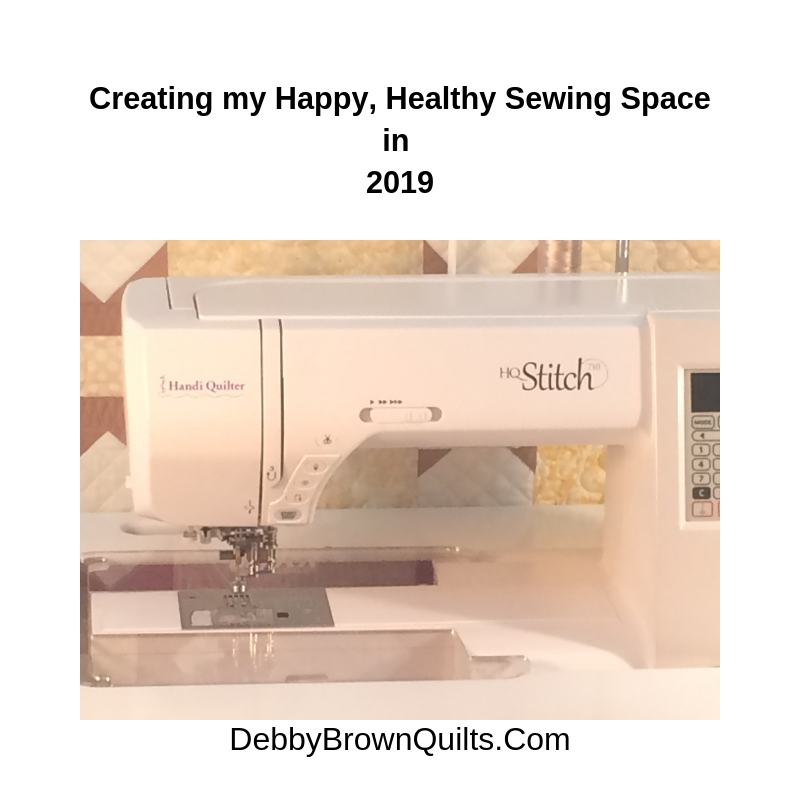 Stay tuned for more photos, tips, and inspiration as I continue to turn my messy, chaotic sewing room into the room of my dreams in this my 50th year! Your laundry basket looks good, empty! 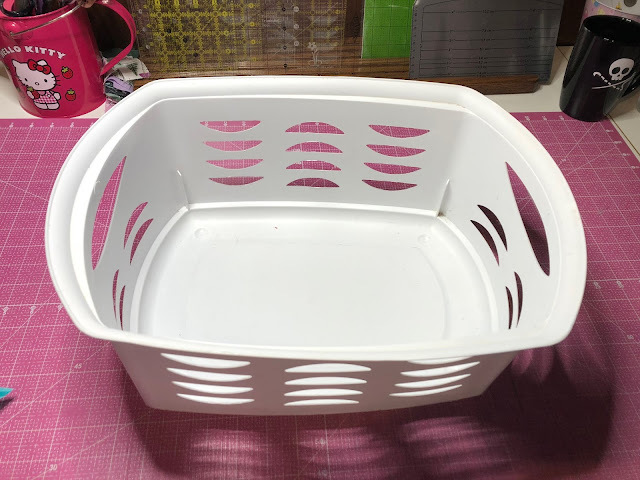 I have been working on emptying a laundry basket too. It seems to magically have more things instead of less every time I work on emptying it. I really like that idea about the shelf liner. I am going to implement that. I have the same problem with keeping my cutting table clean. Let's face it, it is a big empty surface and it just begs you drop whatever you have in your hand and leave it there. I'm trying to come up with a solution and the only idea I've some up with is to have a table next to it where I can put things down. While that table will need to be cleaned constantly, at least my cutting surface will be empty and ready whenever I need to cut. I'm really hoping this works. When it comes to cabinets for a sewing room, I think the best idea I've ever seen was a set of tall cabinets with doors and the shelves were rolling shelves so you could pull them out and see what's buried in the back of them. You could have mostly rolling shelves and then a few drawers as well. I had a friend that had an entire wall of these cabinets, at least 4 sets and it was amazing because they held just about everything and when you closed the doors, the room looked neat. Of course, you need space for this but if you have it, I think it was a fabulous idea. And I think the cabinets were from IKEA and her husband added the doors. I bet your Super Hubby could come up with a great system for you. Happy sewing. Thanks for that cardboard tip. I put mine on shelf liner but that didn't help too much. That cardboard is a good idea. Tried the rubberized shelf liner a long time ago but it doesn't do much good on a carpet. I like the carpet, so perhaps I just have to learn to live with the foot pedal misbehaving.